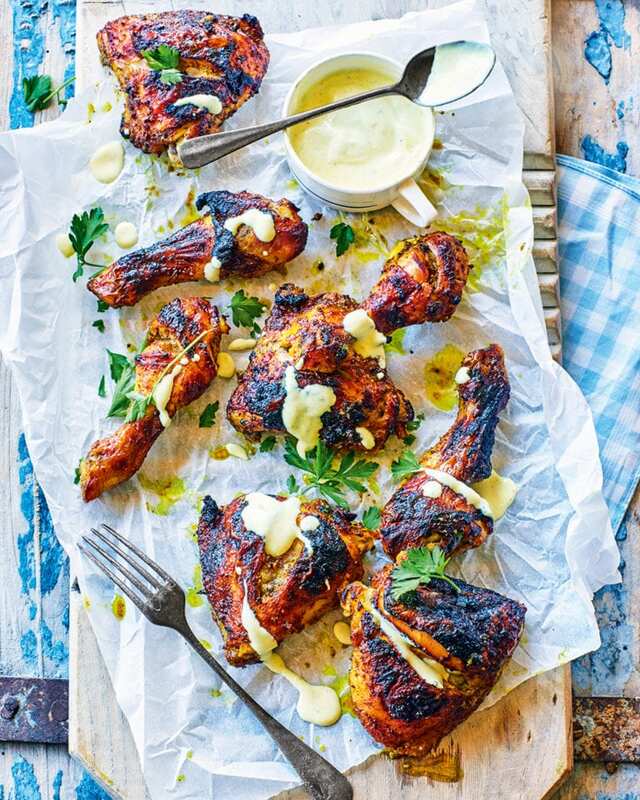 Chicken marinated in cinnamon, cardamom, turmeric, cumin honey and lemon, before roasting, is a gorgeous summery recipe that’s a doddle to make. Heat the oven to 200°C/180°C fan/gas 6. Line a large roasting tin with non-stick baking paper. Divide the chicken legs into drumsticks and thighs by cutting through the joint with a sharp knife. Put in a large mixing bowl. In a small mixing bowl, mix the spices with the olive oil, honey, lemon zest and juice and some salt and pepper. Pour over the chicken and toss well to coat all over. Put the chicken in the prepared roasting tin and roast for 45 minutes until golden and tender, turning halfway through and basting the chicken with pan juices. Put the chicken on a board (or platter if serving straightaway) to cool. Put 2 tablespoons of the pan juices in a bowl with the yogurt, then mix well and season to taste. To serve, drizzle the yogurt over the chicken and scatter with parsley. Roast the chicken and make the yogurt up to 2 days ahead. Store the chicken and yogurt in separate airtight containers in the fridge until ready to serve or pack. Cool the chicken completely before chilling.